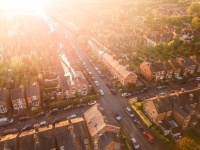 The Halifax has issued a report that reveals that for the first time in eight years, Greater London house prices per square metre stalled – rising just 0.5 per cent in the 12 months to May. Increasing from £5,106 to £5,131 per square metre, this is the lowest growth in the UK year-on-year, although this hasn’t stopped London towns still making up the ten most expensive towns per square metre in the country. The highest annual change was recorded in the middle of the country, with East Anglia, which rose from £2,104 to £2,256 (7 per cent) taking the top spot, the West Midlands going from £1,829 to 1,929 (5 per cent), and the East Midlands coming it at third place, growing from £1,694 to £1,782 per square metre – also 5 per cent. Aside from Greater London, prices in the North increased from £1,339 to £1,364 (2 per cent), and in the South East, £3,147 to £3,215 (2 per cent again). Overall, Westminster is the most expensive town in the UK, commanding prices of £9,379 per square metre (with the average size being a modest 67 square meters), and the best value properties are found in Aberdare, where the average size is 121 square meters at £969 each. Halifax managing director Russell Galley says: “It is no surprise that Greater London is substantially more expensive than anywhere else in the country. Should recent trends persist, prices in the capital will continue to tread water whilst the rest of the country slowly plays catch up.